Volvo is capping the top speed of all its new cars at 180kph from 2020, and from 2021 you'll be able to set an even lower top speed for your own vehicle if you share it with other people. Care Key will let you set a custom maximum speed before lending your car to family and friends, and is intended to help young or inexperienced drivers who have only recently passed their driving tests. Are autonomous cars safe, and how can they earn our trust? 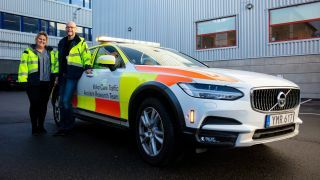 Volvo has set itself the goal of preventing deaths and serious injuries in its new cars by 2020, and the 180kph limit shows that it means business. Public reaction hasn't been entirely positive; some drivers have complained it will take away their personal freedom and make the German autobahn boring. However, the company notes that it received a similar response after its three-point safety belt became an industry-standard design 60 years ago (when motorists claimed being thrown from the car at speed would be safer than being strapped in). The speed limit is one part of a larger push towards safer driving on Volvo's part. The company has also announced plans to fit a cockpit system of cameras and sensors that will monitor drivers and take action if they seem to be distracted or intoxicated. It remains to be seen whether other automakers will follow its lead, or the industry will prefer to maintain a hands-off approach until cars become fully autonomous.